If you want to know the difference between a buccaneer and a corsair, or if you want to know who the most famous pirates were, then you have come to the right place! Julius Caesar was captured by pirates when he was 25. While prisoner, he told them that he would come back and kill them all. He was eventually released, and he kept his promise! Pirates of the Mediterranean were known as "corsairs". Most were Muslim. Corsairs fought with curved swords called "scimitars". They captured people and sold them as slaves. The two most feared corsairs were the Barbarossa brothers. Barba Rossa means "Redbeard" in Latin. From the 1500s Spanish galleons carrying treasure back to Spain from America were often attacked by pirates. Because England and Spain were at war, Queen Elizabeth I encouraged English pirates (called "privateers") like John Hawkins and Francis Drake to attack the Spanish ships. The original buccaneers were drifters and criminals who survived by hunting wild pigs on the island of Cuba. When the Spanish attacked them and killed all the pigs, the buccaneers became pirates instead and attacked and looted Spanish merchant ships. Henry Morgan was a famous buccaneer leader. Buccaneers invented a special kind of sword called a "cutlass"
In the 1650s, most buccaneers moved to a new hideout on Jamaica, called Port Royal. This became a wild and wealthy place full of drunk pirates and runaway slaves. It was destroyed by an earthquake in 1692. Ching-Chi-Ling was a great pirate leader in the South China Seas. He had a fleet of more than 1000 ships. Many pirates were women - such as Mary Read, Anne Bonny, Grace O'Malley, and Ching Shih. The most successful pirate ever was probably Bartholomew Roberts, known as Black Bart. He captured around 400 ships in the 1720s. He was handsome and dashing too! Steam power spelled the end for most pirates. The navy built steam ships which could travel much faster than the old sailing ships, and the pirates could not escape. 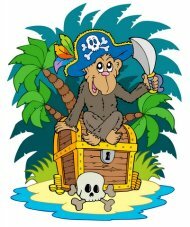 There are still pirates around today, especially in the Caribbean and Far East. They tend to use small boats, and sneak onto merchant ships in the dead of night to steal the cargo. Sometimes they kidnap people and demand ransoms.